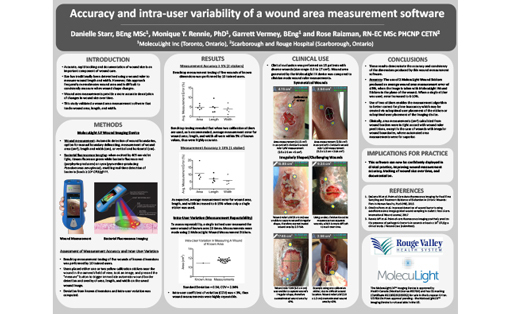 Wound surface area reduction is used as a predictor of healability and an indication of the care protocol efficacy. The variability, of up to 40%, in standard length x width estimation of wound surface area is unacceptable on a measurement on which care decisions are being based. Digital planimetry tools have been demonstrated to be more accurate and consistent than conventional methods in documenting the progress of a wound through the care continuum. 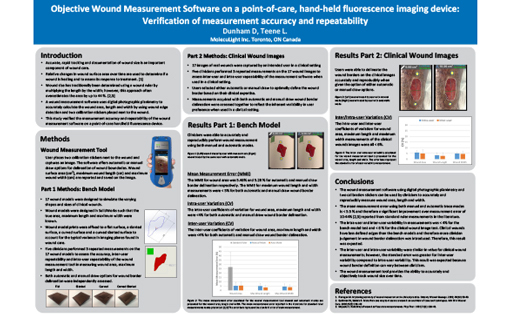 Here we present the use of a hand-held, non-contact wound imaging device that includes fluorescence imaging and documentation of bacteria and software that estimates and documents the area of a wound, using a proprietary algorithm or manual trace functionality. 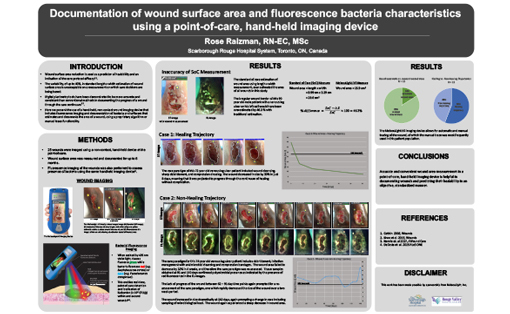 25 wounds were imaged for up to 8 weeks and their progress was documented with fluorescence images of bacterial location and surface area measurements, using either the automatic trace feature or the manual trace feature. All wound measurements were over estimated by conventional methods, with a maximum error of 50%. 10% of wounds areas were estimated using the auto-trace functionality, whereas 90% of the wounds areas were better estimated by manual trace of the wound border. 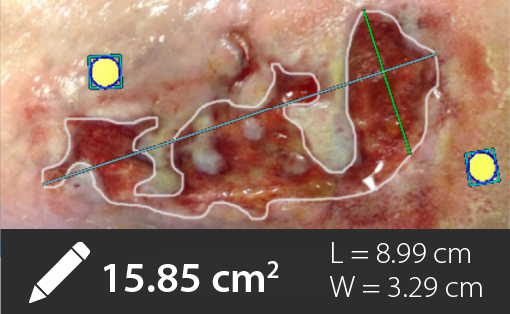 14/25 wounds had surface area reduction indicative of a healing trajectory (30% in 4 weeks), whereas 11/25 wounds were stalled and candidates for care protocol re-assessment. 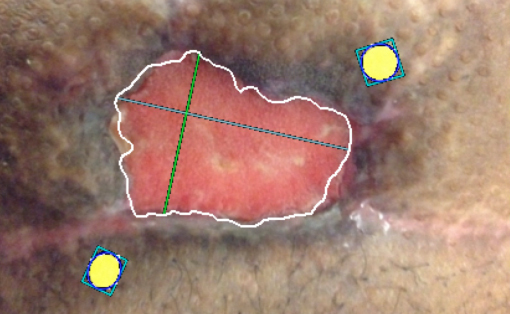 Accurate and convenient wound area measurement in a point-of-care, hand-held imaging device is helpful in documenting wounds and predicting their healability in an objective, standardized manner.